I've teamed up with the guys at CHQ to give my readers a special deal. When you normally sign up for Commerce HQ you get 1 store for the starter plan. With my link at the bottom of the page, you'll get 2 extra FREE stores, that's 3 for 1! To get the two free stores it's really simple. Use the link at the bottom of the page. Then sign up on the home page by clicking on $99 per month for 3 stores. Normally you won't have this option. Here's what you would normally see if you don't use the link. 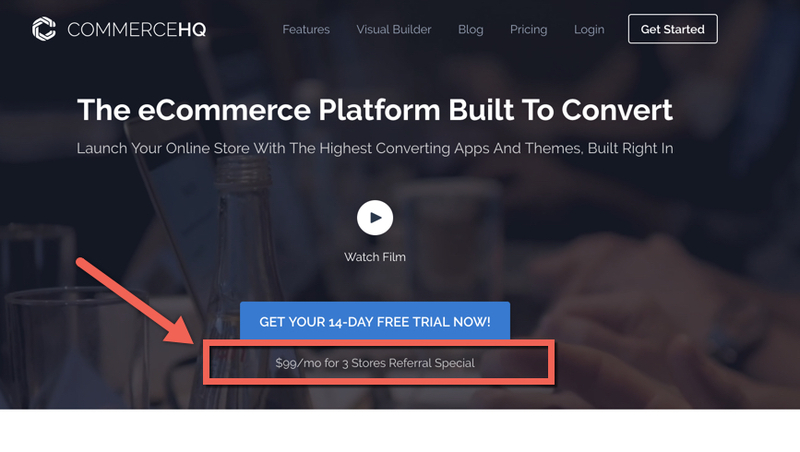 If you click on the pricing page and then sign on for the 14-day free trial on that page then when your trial runs out you will only have 1 store. Sign up on the home page where it says $99 per month for 3 stores. You'll then get the 14-day free trial and the 2 FREE stores with your plan. This is only available with this link. So make sure you do it right otherwise you'll miss out on the 2 free stores. It's also my super secret covert affiliate link. But I'm sure you don't care as you're getting 2 free stores with your plan.